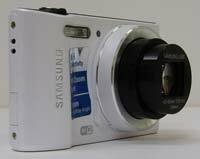 The Samsung WB30F is a 16.2 megapixel compact camera with a 10x, 24-240mm optically-stabilized lens in an ultra-slim body that is only 17mm thick. The WB30F also features 720p HD video recording and a 3 inch LCD screen, built-in wi-fi capability that allows users to email photos from any hotspot or share them on social networks such as Facebook and Picasa, simultaneous stills and video capture and an HDMI port, Live Panorama mode and a range of creative filters and effects. 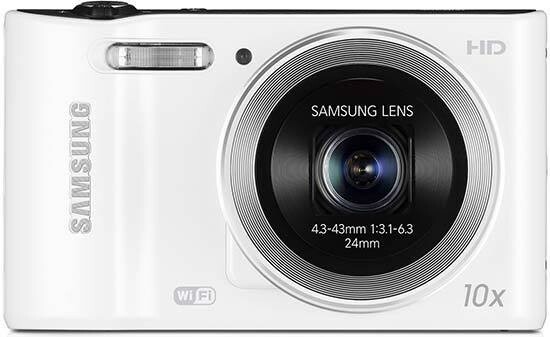 The Samsung WB30F is available now in black, white, red, purple and pink for £199 / $229. This latest Samsung ‘Wide’ and ‘Big’ series camera in the WB30F is surely in defiance of the Trade Descriptions Act; so sleek and small is it. Pitched as the ‘mini model’ in the range, it is narrower than a finger’s width (a depth of 17mmm officially), yet its manufacturer has somehow managed to crowbar in a useful 10x optical zoom supported by optical image stabilisation. This further differentiates the point and shoot from the smartphone and tablet it gives a visual nod to via not only its arctic white livery, but also its on-screen shooting mode icons that visually resemble those for phone ‘apps’. Though the white is quite fetching, black, red, purple and pink are the alternative colour choices for the WB30F. In our now ‘always connected’ age the snapshot is also what is maker has termed ‘smart’. This is by virtue of the fact that it additionally comes with Wi-Fi connectivity and, as with recent NX models, a DirectLink key top right of the backplate via which to implement it, plus an Auto Share feature which can be turned on or off and that automatically backs up pictures to your compatible smartphone. Of more immediate interest to photo enthusiasts is the fact that the lens stretches to a wide angle 24mm in 35mm camera terms for those all-inclusive shots of foreign landscapes, or just a bunch of your mates high on sangria. OK, so it’s not quite a super zoom and neither is it up there with the best travel zooms – such as Sony’s new 30x DSC-HX50 – given this Samsung’s still comparatively modest headline spec. But the WB30F does nonetheless suggest itself as an able travel companion for those who want the zoom capability their phone can’t provide this summer, but don’t want to spend big to get it. We also get just a small quick start guide and warranty card in printed form out of the box, with not extraneous software CD provided. Also downsized since this model was announced earlier in the year is the cost; with ‘e-tailers’ offering it for around £120 instead of the suggested £199.99 at the time of writing. While all this is mostly good news, the under the bonnet spec reveals, unsurprisingly, the WB30F is far from a premium model. The 16.2 effective megapixel top resolution is respectable enough, but it’s derived from a bog standard 1/2.3-inch CCD, plus the maximum aperture achievable is a so-so f/3.1 at the lens’ widest setting. On-screen settings are tabbed through using a familiar multi directional control pad on its right – this isn’t a touch screen model regular smartphone users might expect, although an early press release indicated it was. It does however give another nod to that market by featuring a slot for the fiddly and easy to lose microSD card only. Overall camera dimensions are an official 98x57.9x16.5mm, whilst weigh is an extremely light feeling 131g, so this is very much a camera for slipping into those shorts or the top pocket of a shirt. In fact it is so lightweight that a couple of times we felt the need to pat our pockets to check we hadn’t lost it. Alongside JPEG format stills there is the option to shoot HD video in MPEG4 format with mono sound, though it’s not the Full HD 1920x1080 pixels, but rather the lesser 1280x720 pixels offered by the more budget conscious models. We also missed he lack of a dedicated video record button; instead users have to press the ‘home’ key and tab along to the relevant mode. Still, a frame rate of 30fps is achievable, and fortunately the optical zoom can be deployed once recording has begun, even though its movement is extremely slow, presumably to minimize the distraction of the low buzz of its lens mechanics on the soundtrack. That being said its automatic focusing adjustments are quite noisy in quieter scenes. The front of the WB30F at least looks the part for those after a cool-looking pocket snapshot with extra poke in the zoom department, in being dominated by the 10x optical zoom lens, the housing/surround for which juts out from the faceplate by about a centimetre even when the camera isn’t in use. Top left of the lens, still viewing it front on, is the usual porthole shaped window for the AF/self timer lamp, and alongside this is a lozenge shaped flash that is set partially into a gentle undulation to the left hand side of the faceplate. This forms a slight grip of sorts otherwise absent on similarly featured but smaller zoom powered Samsung snappers such as the ST150F, though a roughened surface rather than silkily smooth one here would have aided grip further. In common with many credit card-sized cameras the positioning of the flash is also such that it’s easy for a fingertip to partially obscure the bulb just in the process of holding the camera. But these are minor gripes that can be leveled at most snapshots in the WB30F’s class. The narrow top plate of the white version of the camera we had in for review features a central black strip into which microphone, speaker, self explanatory power button and main shutter release button encircled by a familiar lever for operating the zoom are set. The ridged lip for the zoom lever doesn’t however sit proud of the curve of the camera’s grip, thereby keeping all the controls contained within the WB30F’s fluid contours. It’s almost easy to overlook the fact that the top plate is also subtly angled forward, so that the forefinger naturally comes to rest on the shutter release/zoom control when gripping it in the right hand. This therefore is a camera that feels immediately familiar on picking it up, which is just what anyone would want from a simple point and shoot. Push the power button with a fingertip and the camera powers up in around two seconds, lens extending from within its housing to arrive at maximum wideangle setting, followed by the backplate LCD bursting into life. No complaints on that score. Squeeze the shutter release button down halfway and after a wait of roughly the time it takes to blink, the AF point/s are highlighted in green on screen. Press the same button down fully to take the shot and be rewarded by realistic sounding audio of a shutter firing, followed by a two second wait whilst a maximum 16 megapixel, Super fine compression level JPEG is written either to card or miniscule internal memory that allows storage of just the one full sized image. The back of the WB30F features the aforementioned DirectLink button top right of the camera back, with a tiny pinprick of an indicator lamp located alongside it and to the left. Obviously the lion’s share of back plate real estate – roughly four fifths – is given over to the standard-issue 3-inch LCD screen with equally average 230k-dot resolution, though it does feature automatic brightness adjustment. There’s no mode button or dial on this camera though we do get a tablet-style ‘home’ button instead, which serves the same purpose of calling up the shooting options on screen with a button press. Whilst this maintains the camera’s sleek, futuristic look and avoids any lumps and bumps on the surface, it does however make it slower to arrive where you want than simply turning a dial straight to your desired setting. Press the home button and you’re presented with seven shooting options on the first screen. From top left on screen these are the default Smart Auto setting, the more expansive Program, a Smart Movie setting that detects scenes and subjects just like the ‘smart’ stills options, plus a further plain Movie option that allows the user to exert some influence just like Program mode does. The bottom row of three options, moving again from left to right, starts with scene mode, a press of which provides access to a rather sparse six settings, taking in landscape, sunset, dawn, backlight, beach and snow and text. Next along is the ‘Live Panorama’ option that allows elongated images to be created whether you’re panning with the camera via the vertical or horizontal axis, and in both directions on each, which is less usual. The final option of the seven on the first screen is for camera settings. This is divided into sound, display, connectivity and ‘general’ options – the latter affording access to the more generic set up options, such as date and time, AF lamp (seemingly on by default), the ability to format the memory in use and wipe all images, or specify the use of the DirectLink button, with the AutoShare option that allows your smartphone to receive pictures being the default here. Other options include the wireless transfer of pictures to a PC, the ability to send images via email when there is a suitable wireless network within range, or upload photos and videos to the Cloud. There is further the ability to use a smartphone as a remote viewfinder if desired; so quite a comprehensive array in a camera so small and outwardly unassuming. Most of these options are in fact repeated as icons on the WB30F’s second screen of app-like settings – MobileLink, Remote Viewfinder, Auto Backup and Email specifically. The third screen is a little bit more fun, affording as it does access to a beauty mode, the night shot mode, close up mode – all of which could have arguably been included with the earlier scene mode setting – plus the rather naff ‘Magic Frame’ option that offers to place your unadulterated still within a rather tacky background – a Christmassy ‘holiday’ option for example. The next option is the slightly more successful ‘Photo Filter’, which are digital effects by any other name. Just about everything one would want is provided here. So we get the now ubiquitous scenery-shrinking ‘miniature’ mode, followed by these effects: vignetting, ink painting, oil painting, cartoon, cross filter (starburst-like highlights), the charcoal-like sketch along with the self explanatory soft focus, fish eye, old film – complete with grain and splotches – the American comic strip style half tone dot, ‘classic’ black and white, retro colour and the final ‘Zooming shot’ which blurs the edges of the frame to make it look as if the shot has been taken mid zoom. Most of these are also available for shooting movies as well as stills, which adds on four colour enhancing/subtracting ‘palette’ effects. To the right of the ‘home’ button is a self-explanatory one for ‘menu’. By this point you might wonder which options might be left on what is supposed to be your common or garden snapshot, and given the comprehensive line up surveyed so far. Press menu however and, via a semi translucent menu overlay that extends two thirds of the way across the screen, once again top of the list of options we’re offered the chance to activate or deactivate the WB30F’s AutoShare feature. Next down on the list is the manually ability to adjust exposure +/- 2EV, followed by the ability to tweak white balance using pre-loaded settings or alternatively take a custom white balance. Next option down on this list governs ISO light sensitivity, with the range extending from ISO80 up to a maximum ISO3200, plus an auto option alongside. Whilst that appears modestly befitting the snapshot status, the flash options that follow next on the menu list are more comprehensive, comprising a red eye reduction and red eye fix option alongside off, automatic, fill in and slow sync. It’s also in this menu list that we can get to switch between normal AF mode and the 5cm macro mode, and adjust the focus area between centre AF, multi zone AF and tracking AF. Face detection options also feature, with, as well as the ability to turn this option on or off, the option to set smile detection or blink detection. The same menu list allows us to set photo quality and resolution, and switch metering between multi zone, spot or centre weighted, whilst turning optical image stabilization on or off as desired. Beneath the home and menu buttons sits the four-way control pad, with settings for display, self-timer, close up and flash settings, at their centre an ‘OK’ button for affecting changes and choices. Completing the button layout, at the very base of the camera are the final two buttons for the obvious playback and delete. 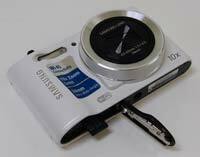 Whilst the left hand flank of the camera is devoid of any features and controls whatsoever, the right hand side features a means of attaching a strap and of recharging the camera via the featured USB port, which is squirreled away behind a small plastic flap.